You guys! I don’t get this excited over cookies that often, but I am so excited about this recipe for 3 Ingredient Peanut Butter Cookies! Seriously. Best. Cookies. Ever. These 3 Ingredient Peanut Butter Cookies taste just like the classic peanut butter cookies, but without the flour or refined sugar! Super easy too. You probably already have the ingredients to make them! If you like recipes with small ingredient lists, you may also like my post about 20 Healthy Desserts with 5 Ingredients or Less. You have got to get in your kitchen and make these healthy peanut butter cookies ASAP! These healthy cookies are so good and very easy. From start to finish it’s less than 20 minutes. No mixer needed! I think the sweet and salty combo is what make these out of this world delicious. 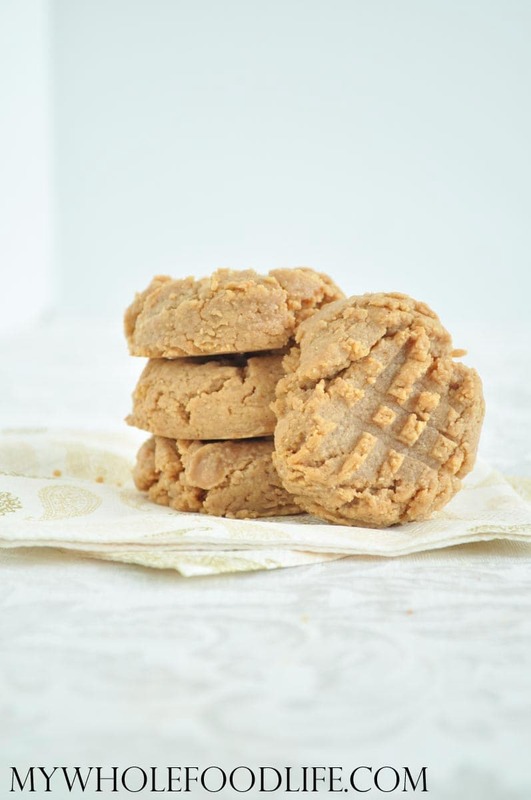 These peanut butter cookies are vegan, gluten free and grain free. If you wanted a paleo version, you can use almond butter. If you needed a nut free version, try using sunflower butter. I think either will work out. All you need is 3 simple ingredients to make this healthy cookie! In a food processor , combine all three ingredients. Use a fork to flatten then and make the cross pattern. These cookies should keep for at least a week outside the fridge and longer in the fridge or freezer. Enjoy!! Hi there - do you know how this would work with PB2 as an even healthier option? I'm not sure if PB2 will work. You can try, but you may need to add another liquid component to balance out the recipe. If you try it, I'd love to know the results! Do you know what the calories are per cookie? if my math is correct, about 172-5. for future reference, add up the calories in the individual ingredients, and then divide by the serving size for calories per serving. edit: divide by servings yielded, not by serving size. that didnt make sense hahah. Hi, I want to make this for a friend who can only have limited amounts of maple syrup (and a host of other things)... Do you have any thoughts on varying the maple syrup amount?? Just curious. I'm eager to try this recipe!! I've tried using less and it doesn't taste as good. Can you try using some maple syrup and some dates? Or some maple syrup and a little stevia? honey will work great too! I wonder if you added chickpea flour if they’d crunch up? Maybe? You will have to add more liquid too, if you add flour.